East Hanover, NJ – April 6, 2018. Americans with disabilities reached a milestone this month, as the major economic indicators showed increases for the 24th consecutive month, according to today's National Trends in Disability Employment – Monthly Update (nTIDE), issued by Kessler Foundation and the University of New Hampshire's Institute on Disability (UNH-IOD). The strengthening economy underscores the value of diversity in the workplace. As hiring increases, preparing for the workplace is more important than ever for people with disabilities. Jobseekers with skills and experience gain employment more readily. Programs that provide hands-on work experiences are equipping people with disabilities with the skills they need to succeed in careers in government, nonprofits and private industries. 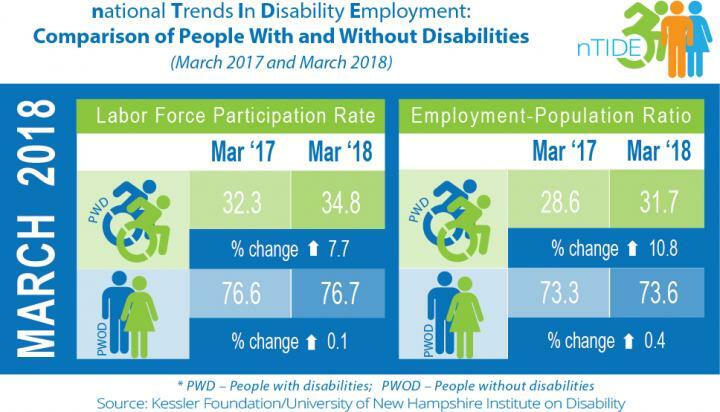 "For the 24th consecutive month, we are seeing improvement in the employment-to-population ratio for people with disabilities, commented John O'Neill, PhD, director of employment and disability research at Kessler Foundation. "This is the longest duration of job gains we've seen during our five years of issuing nTIDE Jobs Reports. Most importantly," he emphasized, "because of this upward trend, people with disabilities are closing in on their pre-Great Recession employment levels." "The gains made by people with disabilities continue to outpace the gains of people without disabilities," said Andrew Houtenville, PhD, associate professor of economics at UNH and research director of the Institute on Disability. "The recent increases in wages may possibly be offsetting some of the barriers that people with disabilities face, and thus making employment more feasible," he noted. For students, internships are a proven pathway to competitive employment. The Washington Center for Internships and Academic Seminars (TWC) connects college students from the U.S. and abroad with semester experiences for academic credit in the DC area. TWC actively recruits students with disabilities, and provides comprehensive support services to ensure their full participation in the internship program. Through its Leadership Initiative for Student with Disabilities, TWC supports scores of students every year, enabling them to choose from the rich array of opportunities in our nation's capital, while employers meet potential job candidates and learn the benefits of workplace inclusion. New Jersey college students are eligible for TWC scholarships funded by Kessler Foundation. "The internship experience is especially valuable for students with disabilities, " said Elaine E. Katz, MS, CCC-SLP, senior vice president of grants and communications at Kessler Foundation. "Like other students, they gain skills and experience and earn course credit. However, effectively managing their disability in workplace requires that they have knowledge of their rights as employees. At TWC, students with disabilities receive the preparation they need to launch themselves into the workplace and navigate their advancement in professional careers." Note that each nTIDE is followed by a noon webinar that features our experts, as well as invited panelists to discuss current disability-related findings and events. You can join live, or watch the recordings at: http://www.ResearchonDisability.org/nTIDE.